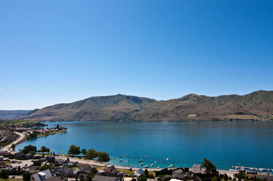 Lake Chelan is one of the premier vacation destinations in Washington State. Lake Chelan real estate offers a wide range of opportunities including Lake Chelan waterfront homes, Lake Chelan community waterfront, Wapato Point Condos and Timeshares and Lake Chelan condos. Lake Chelan is a 55 mile long lake and one of the deepest in North America. The immense size of Lake Chelan and high desert location makes it one of the cleanest, freshest lakes on Earth. Lake Chelan has wonderful wineries and attractions. The Nick McLean Real Estate Group has a market center with local experts and professionals to serve all your Lake Chelan Real Estate needs.